The $11 million mansion Kim Kardashian and Kanye West have bought to start their family life with baby North together is still some way from completion. Despite the arrival of their much-loved baby North 'Nori' West, the mansion is still in an advanced state of renovation and will take some months to finish. So far the plans to renovate are - as you would expect - typically grandiose. In fact, the luxurious home - which she bought in July for $10,750,000, according to Trulia - has been been gutted, as the couple seek to put their own stamp on it. The stunning Mediterranean-style mansion in Bel Air came complete with wrought-iron staircases, chandeliers and 'old world' fittings, which have already been ripped out. Despite buying the house brand new, Kim reportedly ran into many problems with the electric, water and heating in the house and has to completely rewire the place. 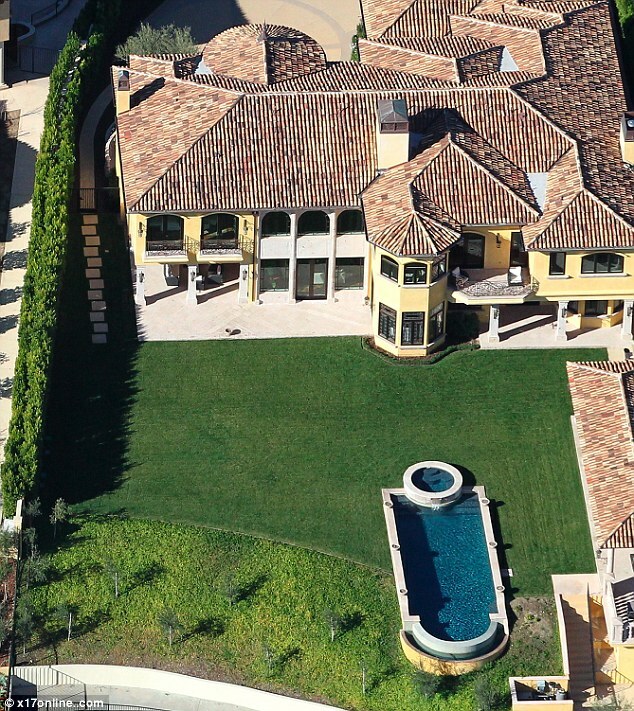 The home sits in a private gated community in the exclusive California suburb, and occupies 10,000 square feet. According to the listing, the 3/4 acre estate is situated on a view-commanding ridgeline. Fittings and furnishings are set to be plush with the couple splashing out £487,000 on four gold-plated toilets and an incredible £750,000 on six special-edition luxury beds. The couple have enlisted the services of the company that supplies beds to London’s exclusive Savoy Hotel. The limited-edition Savoir Royal State Bed, which costs £125,000 each takes hundreds of hours to create from a unique combination of cashmere, carded Virgin lamb’s wool and Mongolian horse hair laid over hand tied, star-lashed springs. Only 60 of the luxury items were ever created in honour of Queen Elizabeth's Diamond Jubilee, meaning Kimye are among a very exclusive group. The bed, the headboard and the canopy are all covered in the same decadent gold silk used to create iconic Hermes ties, equating to some 1,600 miles of thread in total. In splashing out on the lavish beds, the pair will join the likes of Madonna, Kylie Minogue, Elton John and Oprah Winfrey, who are all proud owners of the luxury items. Earlier this week, it was revealed that the couple had splashed out a whopping $750,000 on four gold-plated toilets for their sprawling abode.